Now that spring is in full swing, corn is going in the ground and farmers are evaluating their pastures and meadowlands. Rumor has it that winter kill was substantial this past winter, and now is the time to mend your pastures and meadows. UVM Extension has 4 drills available for rent throughout the Champlain Valley. Currently, the Northwest Crops and Soils Program has a 10 ft Sunflower no-till drill and a 15 ft John Deere no-till drill. Both of these drills are available for use for a fee of $10 per acre to help offset repairs (contact Jeff Sanders at 802-524-6501 to use). 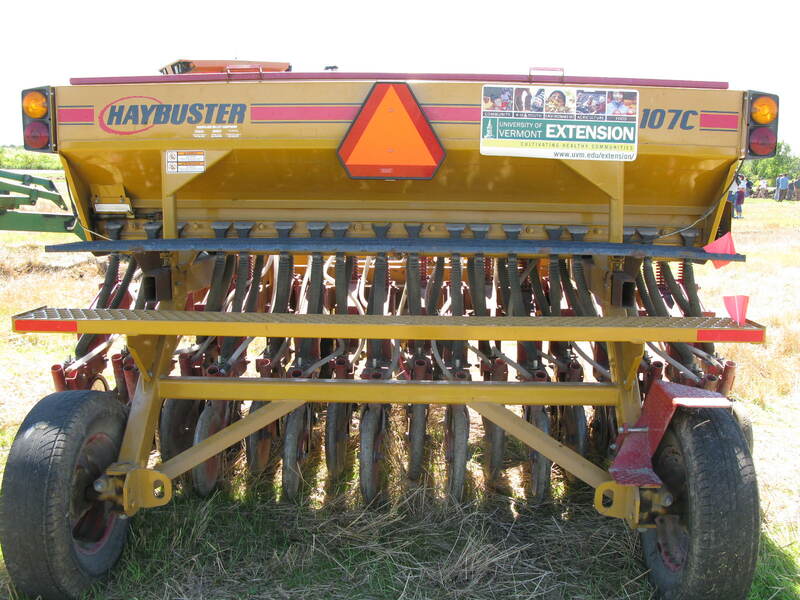 The Middlebury Extension office and the Champlain Valley Crops, Soil, and Pasture team has two 10 ft Haybuster no-till drills available for use (contact Jeff Carter at 802-388-4969 to use). If you call the UVM Extension Offices, we can help get the drills to you and instruct you on how to use them most effectively. When using a drill, there are several important considerations to keep in mind. Pay close attention to your seed mixes. When getting seed custom blended or if purchasing pre-mixed seed, you need to be mindful of seed size. Mixing clover and alfalfa with orchard grass may cause problems in the small seed boxes. Light bulky seeds like orchard or brome grass can be problematic in the seed boxes with the smaller seeds. Try to keep seeds of similar sizes and weights together for a more consistent flow through the drill and more accurate seeding rates. The drills need to be calibrated. It is recommended that you put in a known amount of seed and cover a known area to check your rate. If you dump all of your seed in and only use the chart on the inside of the lid of the drill, you will probably not be happy with the results. The charts are only approximations and once you start putting multiple species of seeds together, you need to check the seed rate manually. Keep track of seeding depth. Spring seeding forage seed only needs to be planted ¼ inch deep to be effective. When checking out the drill, make sure the seed depth is where you need it. The best way to do this is to drop the drill in the field and drive forward about 10 feet. Then get off and carefully investigate the seed trench and check the depth with a ruler. This becomes critical when using no-till drills in ground that has been conventionally tilled. These no-till drills are designed to plant on hard soils. They are heavy and when used in worked ground, all the settings need to be backed off to allow the seeder to “float” as much as possible on top of the soil. When overseeding into a poor stand to rejuvenate it, a seeding rate of 8-10 pounds of seed should be drilled depending on seed varieties selected. When drilling a clearstand or filling in winter kill spots in a field, a seeding rate of 12-18 pounds is recommended, again depending on what you are seeding. Please consult with your seed salesperson, crop consultant, or Extension personnel for more information regarding seeding rates. Don’t plant when it is too wet. The key to drilling seed is getting good soil-to-seed contact and wet muddy soils will result in poor stands. Using GPS. If you have access to a GPS unit, try to get it put into the tractor before you drill. It can be difficult to see where you have been and none of the drills have marker arms. If you have questions or would like more information about drilling, please contact Jeff or Heather at the St. Albans UVM Extension Office at 802-524-6501. This entry was posted on Tuesday, May 12th, 2015 at 10:03 am and is filed under Out Croppings, Uncategorized. You can follow any responses to this entry through the RSS 2.0 feed. You can leave a response, or trackback from your own site.